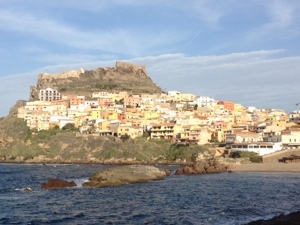 Yesterday we motored to Castelsardo some 10 miles along the north coast from Isola Rossa. The marina was very pleasant set below the ramparts of the old town of Castelsardo, which is on the rough guide’s ‘must see’ list. The town itself is set up high on the cliff top so we ventured up to the old castle and cathedral in the late afternoon. Whilst some of the town is a bit run down (or maybe just out of season), the old part with its steep stairs and alleyways was lovely. 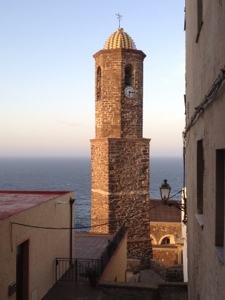 We had a great view over towards the harbour from the Bell Tower, which was originally a lighthouse. We ate on board in the cockpit as it had been another warm day and the marina was very sheltered. This morning we did various chores and finally left around 1.30pm to make the 3 hour journey to Porto Torres, where we are meeting friends, Isolda and Liz, tomorrow. The marina here is fairly ramshackle and reminiscent of Marina Del Sole in Cagliari. There was no one to take our lines so we had to do it ourselves – interesting as you need to get close enough to the quay to pick up lazy lines but not so close you hit it! The office is shut up as are the showers and loos so we will be showering on board again. Hopefully, the office won’t be open in the morning and we won’t have to pay. 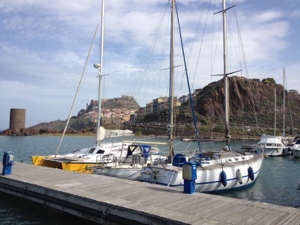 Pictures below of Castelsardo from the marina, Castelsardo with the castle in the background and the Bell Tower. This entry was posted in News and tagged 2012, Italy, Med, Sardinia. Bookmark the permalink.